The latter half of the 1930’s is considered the high point of Johannes Greenberg’s creative work. At that time he was an artist in his fifties. He had begun his studies in art in 1904 already at Ants Laikmaa’s recently opened studio school. He later studied further in Berlin, Latvia and Munich and worked for years in Moscow. 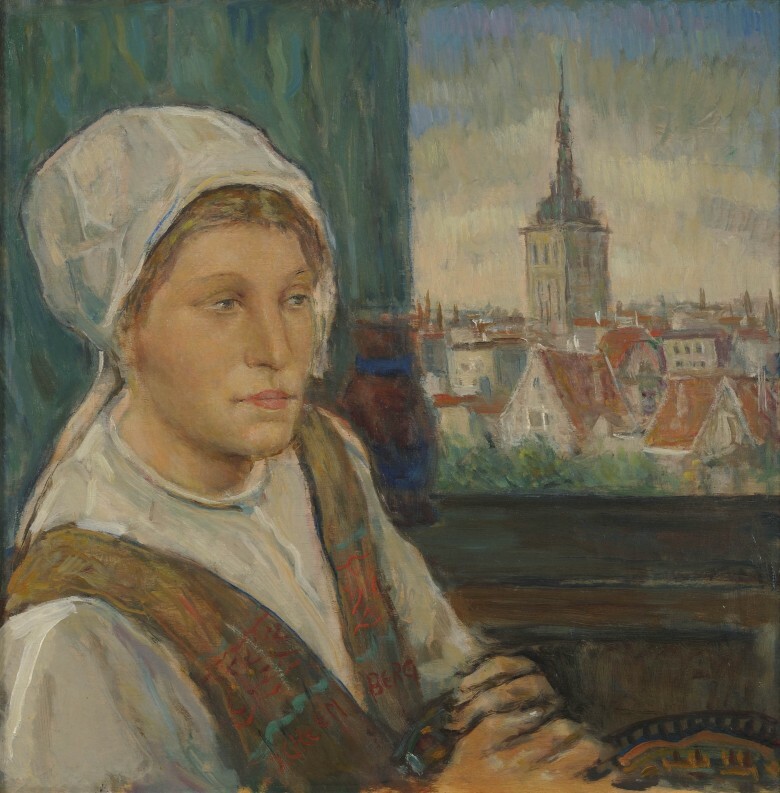 Greenberg did not return to Estonia until 1920 and did not start participating more actively in exhibitions until some ten years later. After a springtime bus trip to Spain, where nature and the works of El Greco and Goya inspired him, an “intense period of searching” began in his work according to researchers of Greenberg, which lasted from 1936 to about 1944. The depiction of half-length figures became prevalent, whereas a woman or group of women who somewhat melancholically or plaintively look off into the distance was a frequent subject. Johannes Greenberg has been considered one of the most colour-sensitive artists in the history of Estonian art. It is interesting to note in this painting how Greenberg’s colouring, which as a rule is airy and rich in nuances, is vigorous and expressive here. It is possible that the restless frames of mind of 1939 – the year in which this painting was completed – are also reflected in its surprising colour combination. Greenberg was extremely receptive in terms of the surrounding political conditions, and thus subconscious impulses could have guided his hand in his choice of colours. 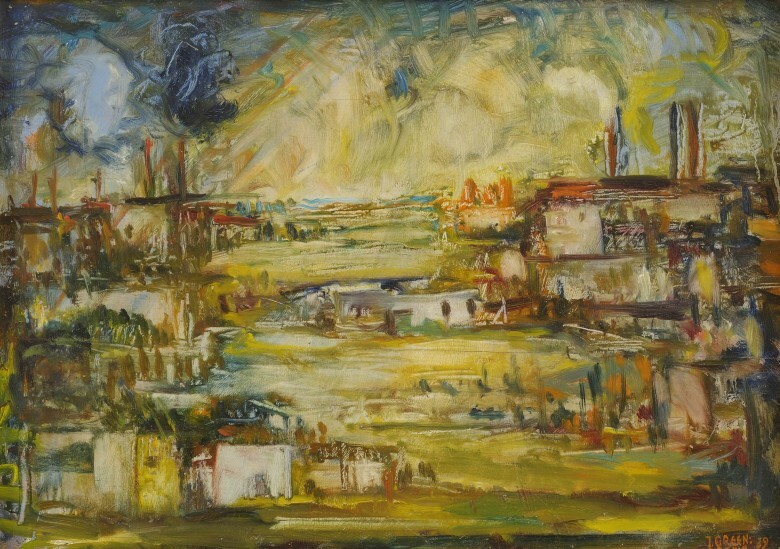 The scene – a landscape – is also more of an exception in Greenberg’s creative work, since we know him first and foremost as more of a creator of figurative paintings. In Greenberg’s works, women’s heads are characteristically covered since as a rule, women wear headkerchiefs, hats, bonnets and other such items on their heads in Greenberg’s works – he rarely depicts them bareheaded. It is also noteworthy that for Greenberg during that period, using models was apparently a “sin against the spirit”, for which reason the woman in this painting was probably also painted according to his imagination. Greenberg has skilfully used the direction and texture of the plywood that forms the base material for this painting. Greenberg liked plywood. It suited his style of painting and other people also noticed that fact. Thus his colleague Adamson-Eric wrote in a review: "His blackish, dark tones are light and in an academic sense, his murky tones acquire brilliance and warmth from the plywood base that resonates with it." Subjects associated with theatre were very frequent in Greenberg’s creative work. That interest has been explained differently – by interest in theatre, by interest in play, by interest in situations where illusions and actuality do not quite coincide. Greenberg continued to create paintings on theatrical themes during the years of the Second World War at the same time as several works of a tragic tone are also known from the same period: "Homeless People", "Consoler", "Mourners", "Sadness", and so on. 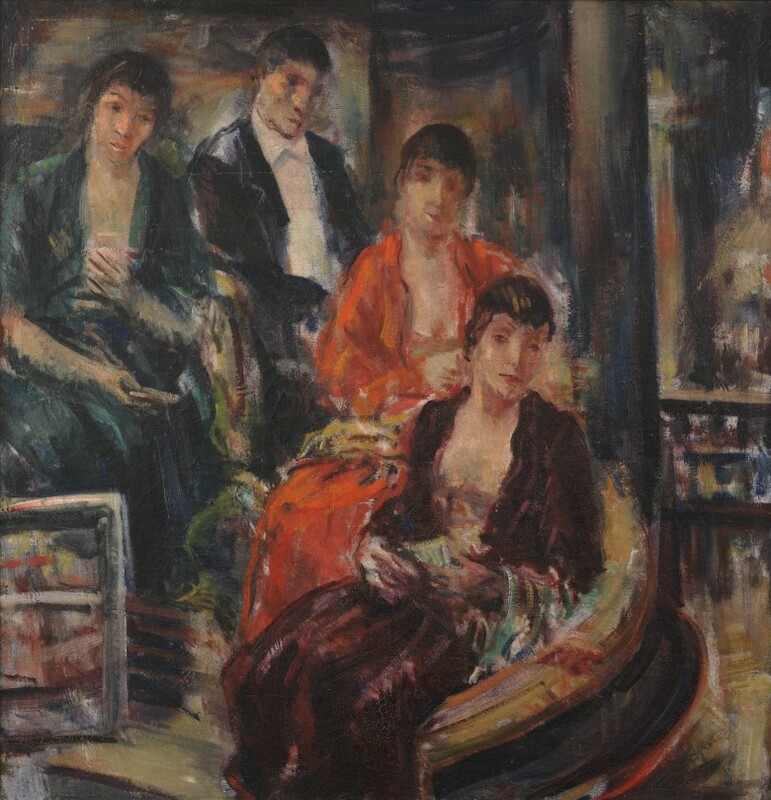 In 1940, one reviewer saw all of Greenberg’s creative work of that time through sadness and powerlessness, directing attention among other things to the fact that the characters in his paintings do not stand but rather sit instead. At the same time, as another possible interpretation, it has been pointed out that it is instead the talent, extraordinariness and sensitivity of the artists (in other words the actors and singers) that was in the focus of the theatre scenes in Greenberg’s later creative work. 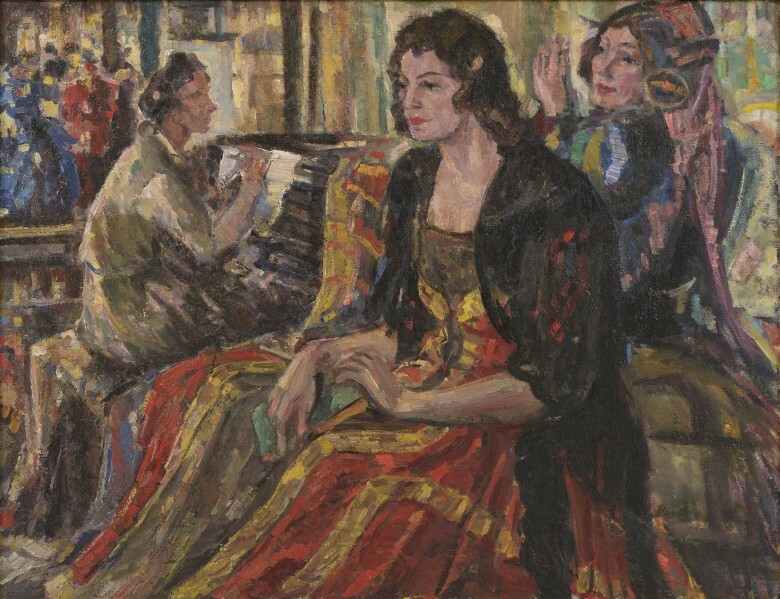 In this painting, Johannes Greenberg has depicted actresses of the Estonia Theatre preparing before their performance. We see their serious and focused expressions and their motionless poses that convey not only the inner concentration of the actresses but also the artist’s melancholy conception of life. Johannes Greenberg depicted the world of the theatre very frequently, especially actors and people wearing masks. This interest has been explained differently – as stemming from interest in the theatre, interest in playing games, and interest in situations where illusions and reality do not quite overlap.